Stalin's desire to modernise agriculture led him to collectivise the farms, amalgamating them and putting them totally under state control. In the end, this did lead to more efficient farming and increased production, but in the short term it involved him in a 'war' with the kulaks, and a disastrous fall in output, which led to famine. Why did Stalin do it? Old-fashioned/ inefficient/ no machinery/ too small/ subsistence (only grew enough for themselves). Essential if the Five-Year Plans were to succeed. By 1928, the USSR was 20 million tons of grain short to feed the towns. If the USSR was to become modern/ industrial, peasants needed to migrate to work in the towns. If the USSR was to industrialise, peasants needed to grow cash crops (eg grain) which could be exported to raise money to buy foreign machinery and expertise. The Kulaks opposed Communism – they liked their private wealth. They hid food from the government collectors. Also they were influential, and led peasant opinion. Stalin wanted to destroy them. 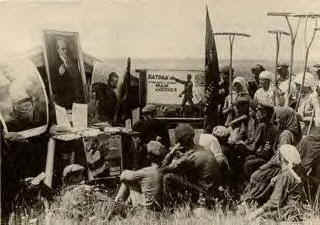 1927 Stalin announced collectivisation – peasants asked to take part voluntarily. Ignored. 1928 Food shortages. Police confiscated food and took it to the towns. 1929 Stalin announced compulsory collectivisation, enforced by the army. The peasants burned their crops and barns, and killed their animals. 1930 Famine. Stalin paused collectivisation. Peasants were allowed to own a small plot of land. 1932–3 Famine, esp. in Ukraine (where 5 million died). Stalin blamed, and declared war on, the Kulaks – their land was taken and they were shot/ sent to labour camps in Siberia/ whole villages surrounded and killed. 1934 All 7 million kulaks ‘eliminated’. 1939 99% of land collectivised; 90% peasants live on one of ¼ million kolkhoz; 4,000 state farms. Farming run by government officials. Stalin's 1929 order simply required farmers to pool their land and their equipment, and to work in future under the orders of the collective farm committee (which was under the control of the Communist Party). No other details - such as how the workers would be paid - were given, and in 1930 Stalin even sent a contradictory order that 'small vegetable gardens, dwelling houses, some dairy cattle, small livestock poultry etc. are not socialised' (at which point, many farmers withdrew from the collectives). Later rules, however, enforced collectivisation, prescribed punishments for 'enemies of the collective farms' (such as the kulaks), stipulated that 90% of the produce had to go to the state (with 10% left to feed the collective), and set up Motor Tractor Stations to provide mechanisation. In the 1990s, when Communism collapsed, many collective farms were broken up and the land shared out between the members. However, in many places, the people preferred to keep their collective farms voluntarily - they liked the security and shred responsibility they offered. Bolshevik teachers instruct a less-than-enthusiastic group of peasants about the benefits of collectivisation. 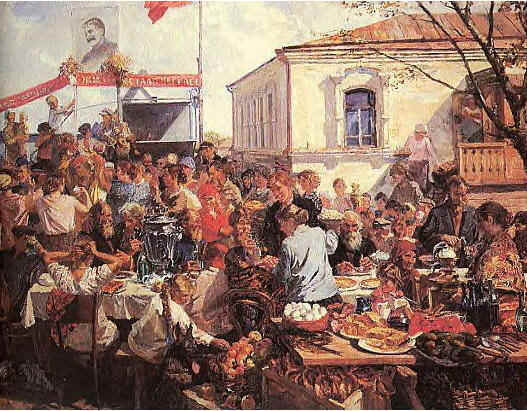 Peasants celebrating on a collectivised farm – a propaganda painting from 1937. 99% of Russia had been collectivized . . .
By 1937, 97 million tonnes were produced PLUS cash crops for export. Officials ran farming. Peasants obeyed the Party, through enthusiasm or fear. Stalin had all power. Fell – see Source C! Many historians believe that collectivisation was as much about establishing Stalin's power as it was about increasing production. What do you think?